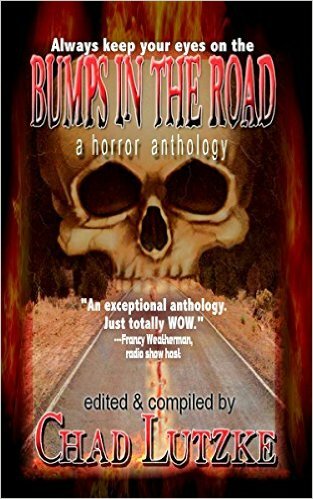 Chad Lutzke, both editor, and contributor of Bumps in the Road has put together quite the clever compilation of stories here. We’ve all hit a bump in the road at times in our life but usually, we get over it… usually. Let’s examine a few of these bumps. Right from the start Shane Simmons opens the book with a real bump. In The Last Seven Miles and Home our narrator has just hit someone while driving home. Hmm… it’s the middle of the night, no witnesses, can he really get away with it? Now, Chad Lutzke has his driver facing an entirely different type of bump. Deprivation is about a long haul trucker on the road with a freaking bad tooth. He’s been self-medicating with good ol’ Jack and Tylenol and he still can’t find any relief. Can’t eat, can’t sleep, desperate times call for desperate measures. Everyone has driven past those rest areas along the highways on their way to wherever. Sometimes you stop to empty your bladder or grab a quick snack from the vending machines, but have you ever stopped to catch a short nap in the middle of the night? No thank you, there is just something creepy about being parked in the middle of nowhere and not knowing who else will be pulling in. Ink by Kevin M. Folliard gives us a reason to just keep on driving. Oh yeah, just like AC/DC sings “Living easy, living free Season ticket on a one-way ride” Johnny and Elijah were on a one-way ride, only Johnny didn’t know that Elijah knew. Check it out in Glen Damien Campbell’s No Good Deed. Whoa! What a trip, Road Trip Bingo to be exact. What would you do if you drove past a vehicle just like yours and catch a glimpse of the occupants that look just like yours? Creepy, huh? I think I would just keep on truckin’, but James H. Longmore shows us what could happen if we dare to meet our match, or in this case matches. Hah, talk about a bump in the road. You surely have experienced those FUN family vacations where everyone is miserably crammed into the car for that long drive to the ideal spot. Kyle Yadlosky takes us for a ride in To the Grand Canyon where sometimes vacations can be magical. Besides the above stories, you will also find offerings from Donald J. Bingle, Adam Vine, Bekki Pate, John Boden, Suzie Lockhart & Bruce Lockhart II, Jon Rollins, Kelly M. Hudson, Vincent Treewell, Stanley Webb, Pam Farley, and Michael Brodie. All of the included stories are good and fit right in with the theme of this anthology. Sooo… get ready for a bumpy ride, order your copy HERE! I did not realize Chad was working on this … sounds like a good read….